Tracey James, the Managing Director of Civic Motoring Services, is one of only a few women within the motoring services profession, who through hard work and determination has succeeded in winning the Welsh Businesswoman of The Year Award. Civic Motoring Services recently became a Bosch Car Service Centre, the only one in Swansea, Neath & Port Talbot area. We also subscribe to the Motor Industry Code of Practice - Service and Repair. All staff at Civic Motoring Services are Bosch Trained, along with IMI & Hybrid certifications and are constantly being trained to keep us up to date with modern technology providing our customers with complete peace of mind for their vehicle. 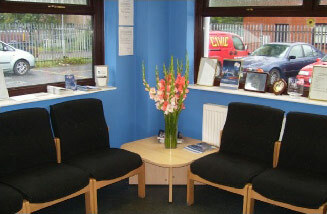 We have a comfortable customer waiting area (shown above), accessible by disabled persons, where customers can relax with; Television, a good selection of Magazines, Hot and cold drinks, snack machine, Baby changing facility, WC (with disabled facilities), Telephone and Fax facilities and also free Wi-Fi access. Within walking distance there are hotels, 24 hour supermarkets, family restaurants with play areas and picturesque walks. A modern purpose built premises situated in the Swansea Enterprise Park some 1.5 miles from the M4 junctions 44 & 45. MOT available for Class IV & VII using our "state of the art" MOT testing station. Air Conditioning testing and re-gassing.